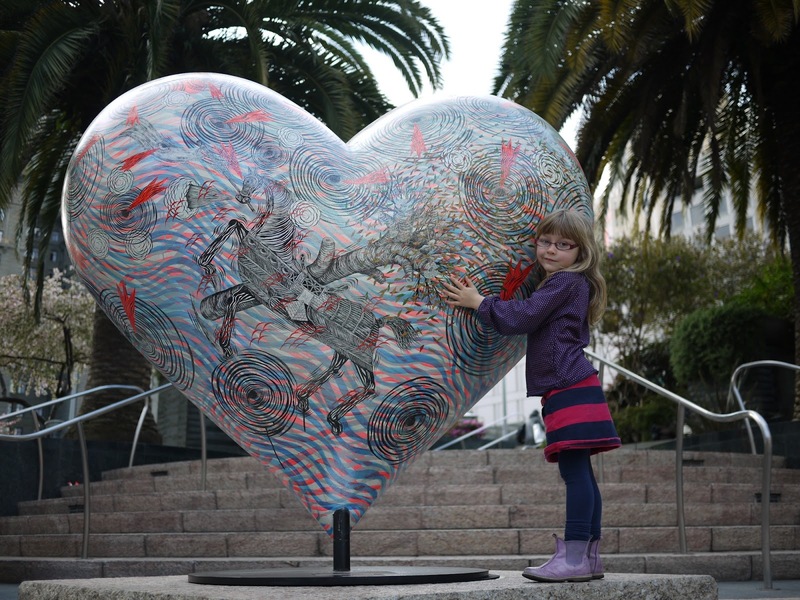 The hearts that can be found in Union Square (among other locations) are made by local artists as part of a fundraising program for San Francisco General Hospital Foundation. 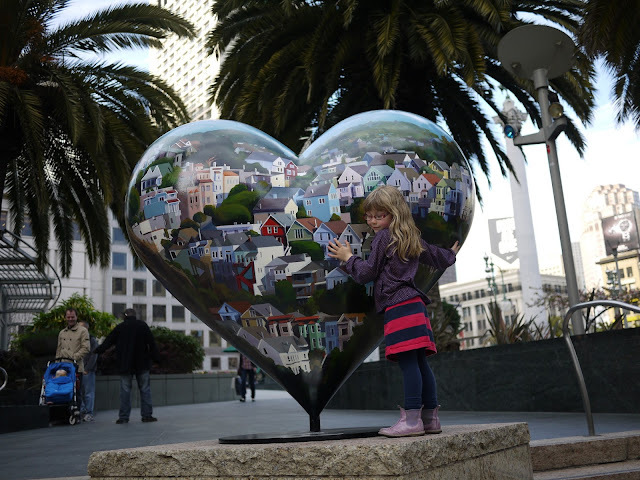 Every year a new batch of 5 foot high, 400 pound hearts are made, put on display around the city and auctioned off to raise funds for the hospital. It's a great fundraiser and brings a nice dash of colour to the streets San Francisco. 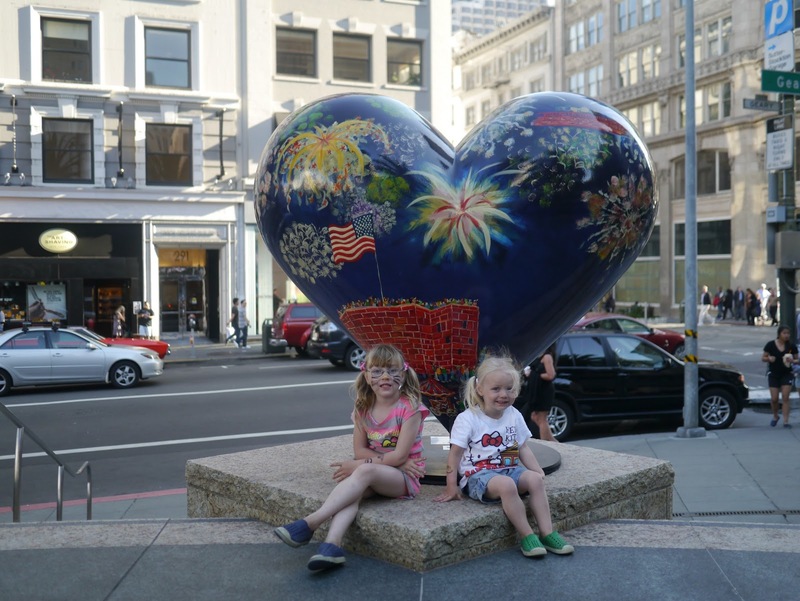 Many of the hearts are purchased by companies that then put them on display in their foyers. 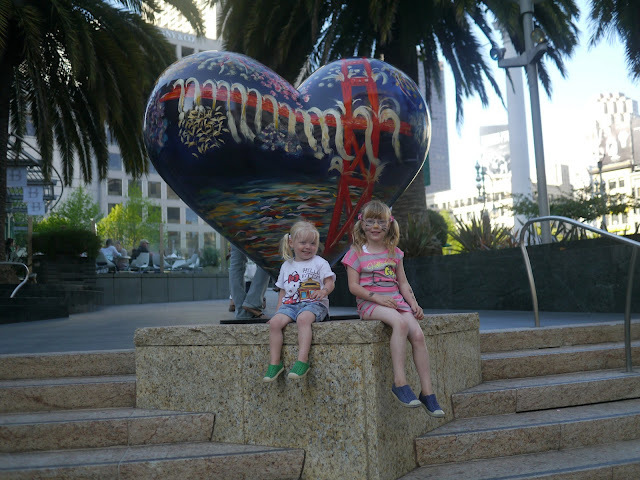 We regularly walk past a heart in the foyer of a Wells Fargo bank on Market Street but only ever at night when it's closed. 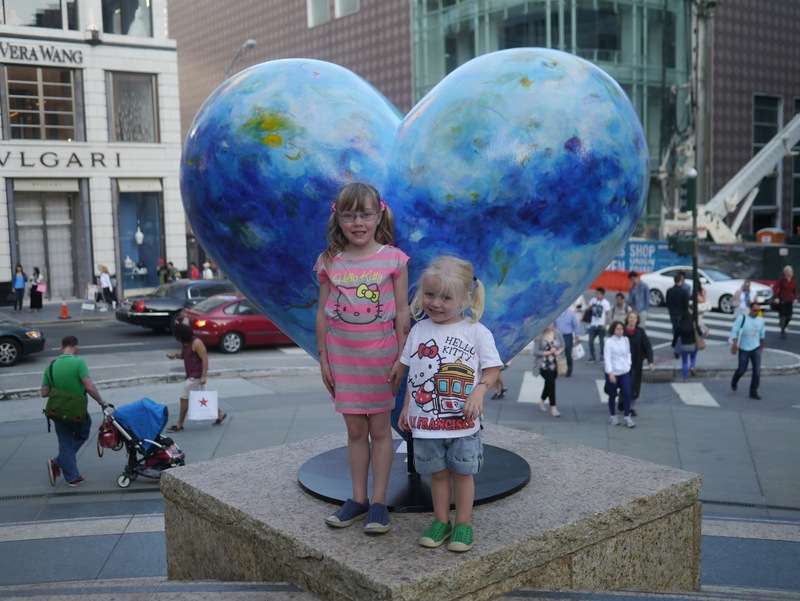 We've also seen a heart in the foyer of the Cartoon Art Museum. So far they're the only hearts outside of Union Square that we've been able to find but I know that there are many more in places open to the public. 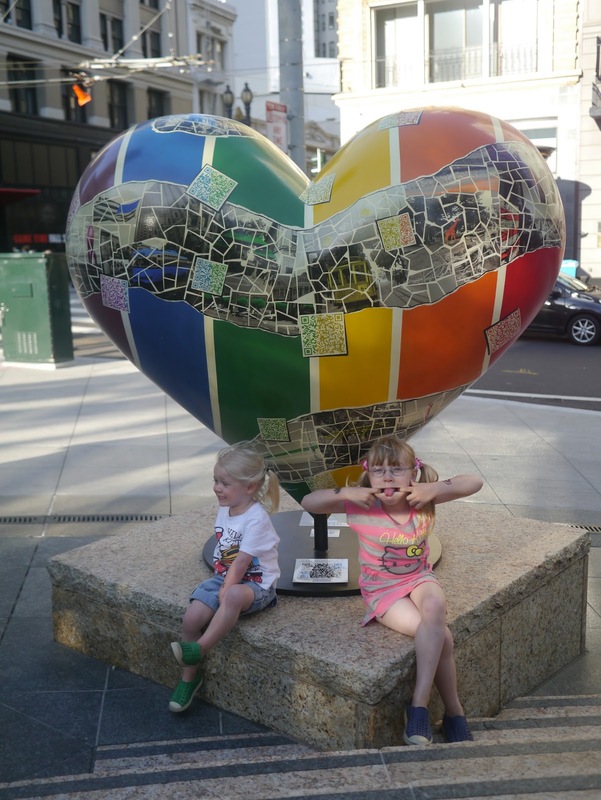 As both Ava and Lola love seeing the hearts I've been meaning to track down a list of their locations around town so we can go on a heart treasure hunt one day. In the meantime I thought I'd share the hearts that we've had the pleasure of seeing so far. 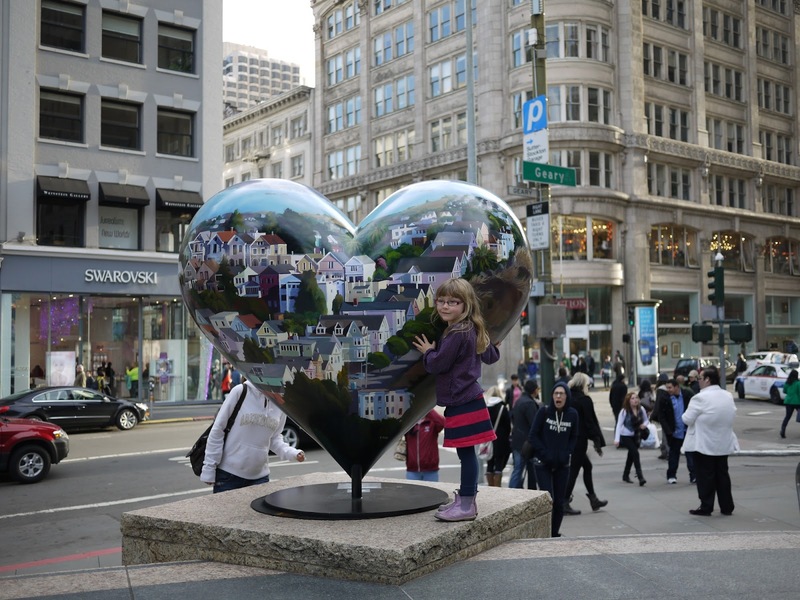 All of these have been on display in Union Square and the girls are always super excited when new hearts appear - as we discovered this past weekend. The Bay Bridge by night. 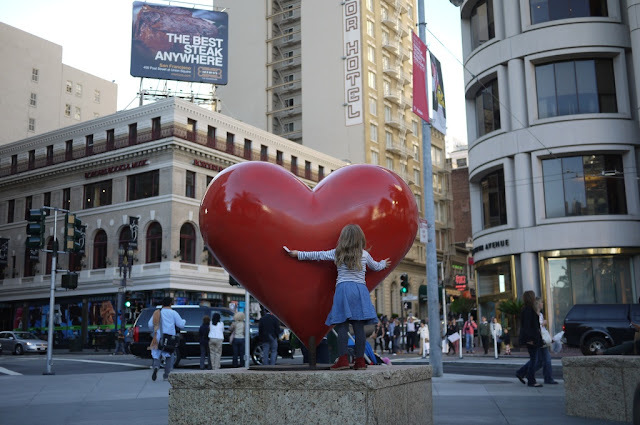 The heart on the corner of Post and Stockton Streets. 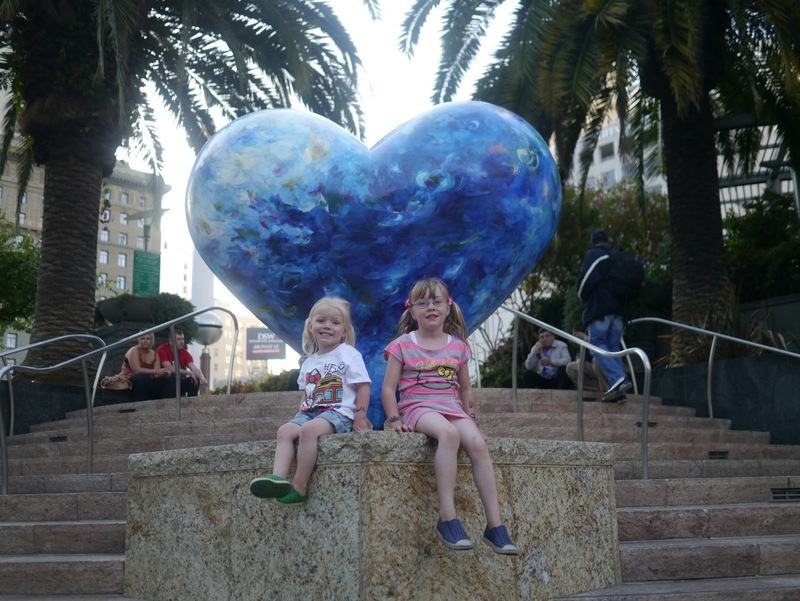 My favourite heart of all so far. This one was on the corner of Powell and Geary Streets. The heart on the corner of Powell and Geary Streets. 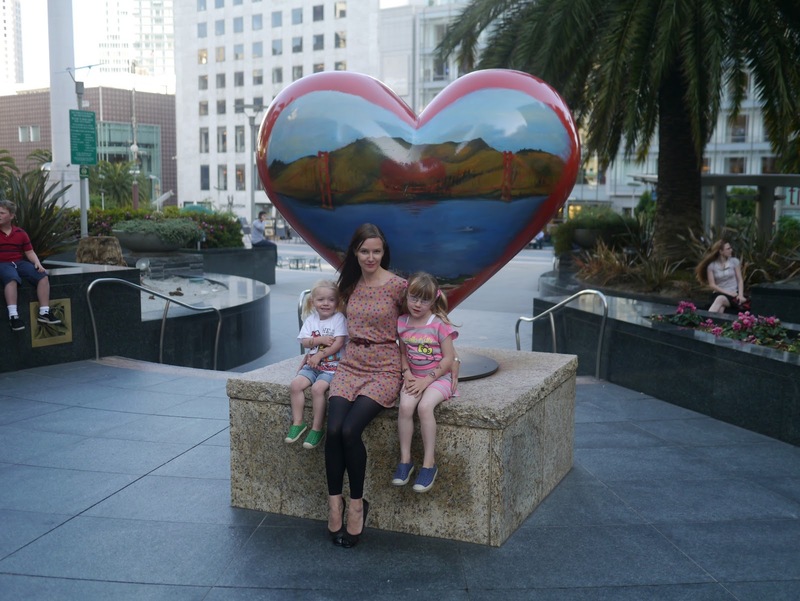 Ava first fell in love with the hearts of San Francisco on our first day in the city back in October 2011. 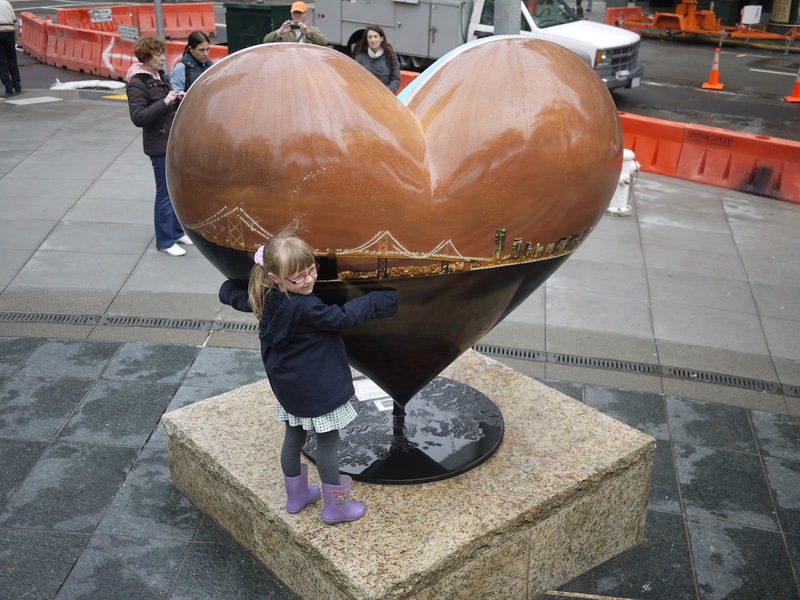 There was only one heart in Union Square when we first arrived (the 2011 hearts had already been auctioned off) and this is the one that remains constant. It's located on the corner of Powell and Post Streets at the top of Union Square. It's a huge favourite with tourists and a huge favourite of Ava's too. 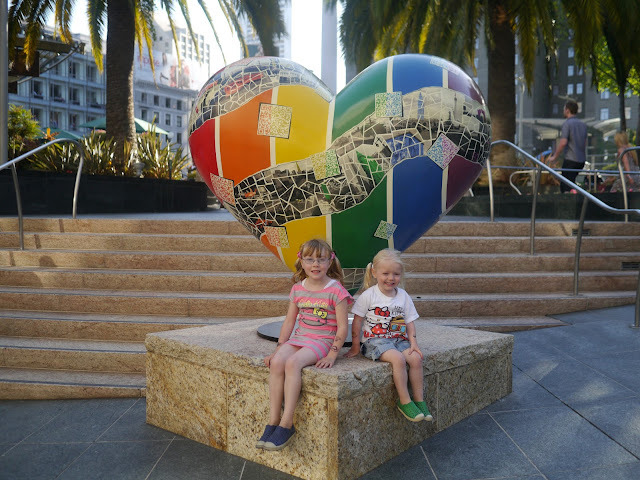 Fingers crossed we'll be able to track down more of these wonderful heart sculptures in San Francisco for our treasure hunt during the Summer vacation. 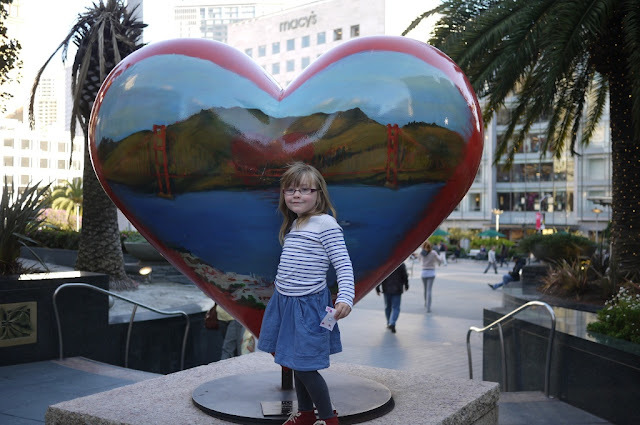 If anyone knows where we can find more I'd love to hear from them. Thanks! Thanks. I am in an Asian country and enjoyed good views of a San Francisco street full of hearts. 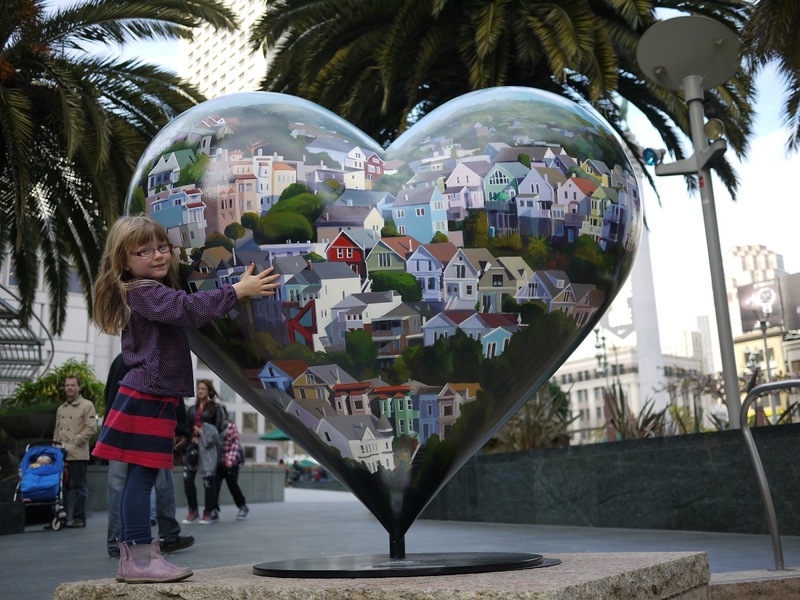 One may expect much more to see in these pictures of the city and I am sure page visitors would have left their heart at other places as well. 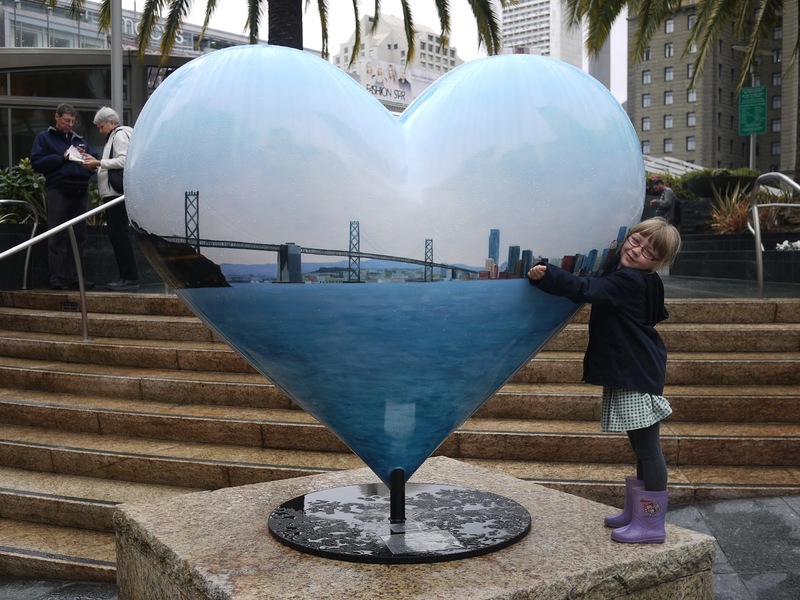 Regards to all of you.